The Spy Recovery Pro is the ultimate data recovery and data monitoring tool. This combination software, offers 4 different recovery tools in one product. 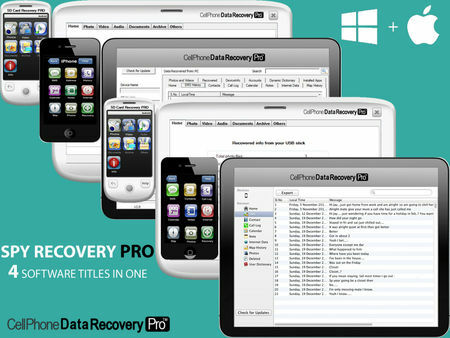 With this software you can recover deleted data and monitor data on a range of devices, including iPhone, iPad, iPod Touch, Android devices, SD Cards and USB Flash Drives. The software is all compatible with Windows PCs, with a Mac compatible option also available for iOS recovery. This is the ideal data monitoring tool for parents who are looking to monitor their child, particularly where children have multiple devices which they use. With the rising use in technological devices, it is important that parents are able to monitor and prevent any potentially dangerous situations that their children may face. With the Spy Recovery Pro, parents can not only monitor current data on the device but can also find data which may have been deleted several weeks or even months ago. The software is installed on one CDROM; for access to the data you need, simply enter your activation code provided with the product. The Spy Recovery Pro can be used on an unlimited number of compatible devices, providing a genuine saving compared to if these software titles were purchased individually. For SD Card's, CDR 500 can recover Photos, Videos, Audio, Archive files and Documents.